This year the Surpass Community has achieved a significant milestone: together we have delivered our 20 millionth on-screen test! We’d like to thank all of the Surpass Community members who have contributed to us reaching this major landmark. 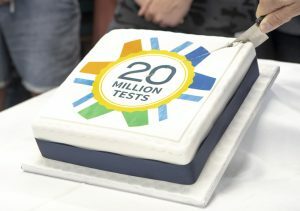 Almost 3 million of those tests have been delivered just in the last year! So how did we get there? 20 million tests alone is impressive, but did you know that Surpass assessments are delivered in 125 countries? We’re proud to be trusted by some of the world’s leading awarding and professional bodies, to develop and deliver tests around the world. Surpass powers the assessment of organisations across a range of industries, including higher education, medical, professional, and vocational; and you can find out more about the Surpass Community members who have contributed to this great achievement on our ‘who we work with’ page. 40 million good wishes if every candidate hears ‘good luck’ from at least two people, and who knows how many millions of congratulatory hugs, celebratory drinks, and ‘well done’ parties on results day! Let’s not forget, it’s not just delivering the same tests over and over that has contributed to this milestone: the continued collaboration between BTL and our customers means that over £7 million of investment has gone back into the product in the last year alone, for the development of new and innovative features, all contributing to Surpass Community organisations expanding their reach and testing capabilities, and keeping Surpass as one of the most widely used assessment platforms. Together, we can achieve our mission statement, which we know is close to the heart of all Surpass Community members, and we can continue to ‘significantly improve the assessment experience for everyone’. Here’s to the next 20 million! Want to be part of reaching the next milestone? Get in touch today to discuss how Surpass can work for you. Based on each computer-based test replacing a 7 page paper test.